Union Food Processing Minister Harsimrat Kaur Badal expects more than $28 billion worth of foreign direct investments (FDI) in the food processing sector in 2019. The ministry is eyeing the next edition of its flagship investment show World Food India, set to take place in November, 2019, to reach that level. "At the first edition of World Food India last year, we had investment proposals of more than $14 billion, of which ground has been broken for projects worth $11 billion. So, next year, we are targeting to at least double the figure, as investments," Badal said. Of the 11 companies that had signed agreements, eight have started on-ground investments. These are set to open a couple of hundred outlets shortly, Badal said. "When I took over in 2014, FDI in the sector was $500 million, which we brought up to $905 million till the last financial year," Badal said. The greater part of the investment was a $500-million investment by US e-commerce major Amazon in retailing of food products in the country. At present, 100 per cent FDI in food processing sector is allowed through automatic route. In 2016, the Centre allowed 100 per cent FDI through approval route for retail trading, including through e-commerce, in respect of food products manufactured and produced in India. "We have increased the number of mega food parks from the two to 22 since 2014. If the earlier two created 5,000 jobs, the number is now close to 300,000," Badal said. However, Badal complained that access to credit remains a major problem as banks are unwilling to provide loans to an industry that has remained investment heavy. Her push for a separate non-banking finance company dedicated to the sector has run into problems with the Prime Minister's Office, which has questioned the idea. "PMO has said there are already a large number of NBFCs. It wants us to engage with Nabard, despite it being a non-starter earlier as well," the minister said. We wanted the NBFC not only for lending purposes, but also for creating an environment where risk assessment, sensitisation would be at play, she said. We had also made it clear that it was going to be run as a proper business that will create the capacity to understand the challenges of funding, Badal added. Kartarpur corridor talks still on Badal said the upswing of violence at the international border will not affect talks on the Kartarpur corridor in Punjab. Senior officials from the Ministry of Home and External Affairs will be meeting on Thursday at the Attari-Wagah border to discuss early operationalisation of the Gurudwara as an international religious destination. "Pakistan has said the entry will be only for Sikhs. But our party's position has been that entry should not be restricted for anyone since Guru Nanak ji belonged to all of humanity," Badal said. India has acquired a 50-acre plot to build a state-of-the-art passenger terminal to transport at least 5,000 pilgrims each day from Dera Baba Nanak, Punjab, to Gurudwara Kartarpur Sahib, Pakistan. Punjab Chief Minister Amarinder Singh has said the current system proposes an extremely limited window of travel and would remain restrictive. While he has demanded "passport and visa free 'khule darshan', Badal did not confirm if India would officially demand for it. "Getting in through visas may be a hassle, but visiting Kartarpur should be as easy as visiting the Golden Temple," she said. "The Kartarpur Corridor will be ready before the next Gurpurab (12 November) and I'm proud that for the first time a government in the country has been able to do this. The government had committed to it and will be going forward on it despite current tensions," Badal said. India's media and entertainment (M&E) sector grew 13.4% year-on-year to touch ?1.67 trillion in 2018, powered by digital platforms that grew 42% to ?16,900 crore (Rs.169 billion) during the period, a new report said. 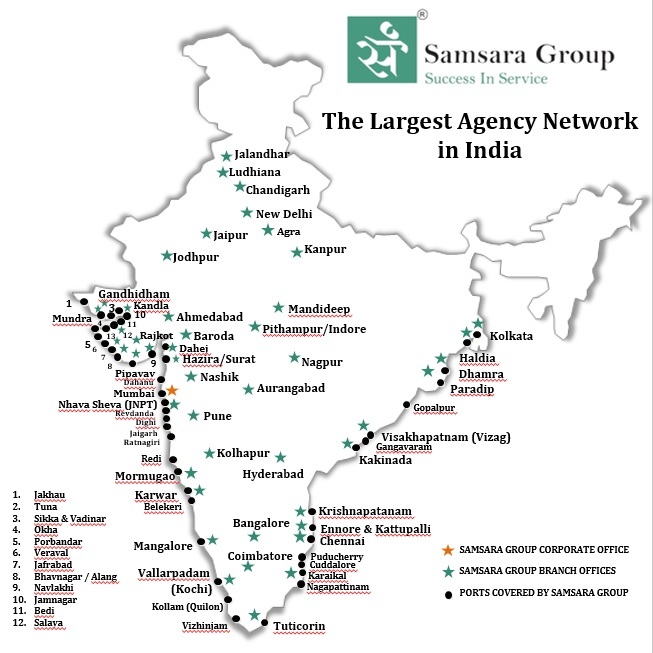 The M&E sector in India is expected to cross ?2.35 trillion ($33.6 billion) by 2021, at a compounded annual growth rate of 11.6%, according to the report by lobby group Federation of Indian Chambers of Commerce and Industry (Ficci) and consulting firm EY. Digital will continue its scorching pace of growth to overtake filmed entertainment in 2019 and print by 2021, said the report titled A Billion Screens of Opportunity, released in Mumbai on Tuesday at Ficci Frames, an yearly media and entertainment industry event. At 570 million, India has the second-highest number of Internet users after China, growing 13% annually and estimated to reach five million by 2021. The report estimates that approximately 2.5 million consumers in India are digital only and would not normally use traditional media. Digital ad spends grew 34% to ?15,400 crore (Rs.154 billion) and now account for around 21% of the ad market. Several broadcasters have started combining selling of ads across over-the-top (OTT) and linear platforms to enable better monetization of marque properties and increased utilization of digital inventory. As far as the various video-on-demand services are concerned, advertising growth outpaced subscription growth and is expected to comprise 52% of the total pie by 2021. Digital subscription grew 262% to reach ?1,400 crore (Rs.14 billion) in 2018, primarily on the back of telecom companies (telcos) bundling content with data packs to drive sales. Video subscription revenues grew almost three times in 2018 to reach ?1,340 crore (Rs.13.4 billion) (with telcos making ?350-400 crore out of this), on the back of new and relaunched video streaming platforms, growth of smartphones, spread of affordable broadband, regional language and exclusive content, and live streaming of major cricket and other impact properties. "The M&E sector has a significant opportunity given India's young demographics. The growth of digital infrastructure is further enabling Indians to fulfil the need for personal content consumption, across languages and genre. There is a large shift in consumer behaviour from mass produced content to specific content defined to audience segments," said Ashish Pherwani, partner and media and entertainment leader, EY India. Further, the TV industry grew from ?66,000 crore to ?74,000 crore (Rs.660-740 billion) in 2018, a growth of 12% and is estimated to reach ?95,500 crore (Rs.955 billion) by 2021, with advertising growth at 10% and subscription growth at 8%. TV advertising grew 14% to ?30,500 crore (RS.305 billion), while subscription grew 11% to ?43,500 crore (Rs.435 billion) this past year. Television viewing households increased to 197 million, a 7.5% increase over 2016 with 77% of time on television spent on general entertainment content and film channels. The impact of the new Trai tariff order where viewers can choose and pay for individual channels can have implications on total viewership, free television uptake, channel MRP rates and ad revenues, according to the report. However, 2019 promises further growth because of the Lok Sabha elections and the ICC World Cup. Print accounted for the second largest share of the Indian M&E sector, despite being static and growing at 0.7% to reach ?30,550 crore (Rs.305.5 billion) in 2018. The year witnessed a 26% growth in digital news consumers over 2017 when 222 million people consumed news online. Page views grew 59% over 2017 and average time spent increased by almost 100% to 8 minutes per day in 2018. Advertising revenues stood at ?21,700 crore (Rs.217 billion) and subscription revenues grew marginally by 1.2% to ?8,830 crore (Rs.88.3 billion). Newspaper advertising reduced by 1% while magazine advertising fell 10%, because of reduced ad volumes and pressure on effective rates. Hindi newspaper publications continued to lead with 37% of total ad volumes, while share of English publications stood at 25%. The Indian film segment grew 12.2% in 2018 to reach ?174.5 billion, driven by the growth in digital rights and overseas theatricals. Domestic film revenues crossed ?100 billion with net box office collections for Hindi films at ?32.5 billion-the highest ever for Hindi theatricals. Overseas theatricals grew to ?30 billion from ?25 billion in 2017 where China became the largest international market for Indian content. Box office collections of Hollywood films in India (inclusive of all their Indian language dubbed versions) was ?9.21 billion with Avengers: Infinity War emerging as the highest Hollywood grosser in India. "The Indian M&E sector is entering a phase of accelerated growth. The status quo is being shattered by digital disruptions and that's unshackling the creative economy in India like never before. These are exciting times for all it is to let our imagination and ambition guide us," said Uday Shankar, vice president, Ficci and chair, Ficci media and entertainment division. Other major deals included Unilever buying out GSKs consumer business in the country for over Rs 31,700 crore (Rs.317 billion), Schneider Electric, TPG Capital, KKR, Softbank, and Alibaba among others. Besides, there's good export demand for Indian cotton from many other countries like Bangladesh, Vietnam, Indonesia and many more, it is learnt, as per reports. In a bid to boost reserves, Bangladesh has tendered to import 50,000 tonnes of milling wheat, it is learnt. The deadline to submit offers is March 25, with validity up to April 4, an official of the Directorate-General of Food, Bangladesh's state grains purchasing agency, was quoted as saying. Wheat with 12.5 per cent protein has been sought for shipment within 40 days after the contract signing. Offers should be on C&F liner out terms which includes provisions for ship unloading, reports said. Key policymakers from India and African nations will brainstorm on strategies for scaling up bilateral trade volume to USD 150 billion in the next few years at the India-Africa Project Partnerships Conclave to be held here between March 17-19. The conclave coheres into the Indian Government's broader vision of long-term engagement with Africa and its uninching commitment to expanding the canvas of India-Africa economic partnership which is evident from the increase in bilateral trade between India and Africa by nearly 22 per cent from touching USD 62.66 billion in the year 2017-18, it added. Senior Ministers from 21 African nations will participate in the 14th CII-Export-Import Bank of India Conclave, which will also see the presence of India's Commerce and Industry Minister Suresh Prabhu. Mahamudu Bawumia, Vice President of Republic of Ghana, Dr. Ibrahima Kassory Fofana, Prime Minister of Republic of Guinea, Monyane Moleleki, Deputy Prime Minister of Kingdom of Lesotho will be present in the conclave. The deliberations at the Conclave will be guided by long-term goals and objectives including encouraging Indian exporters to access the African countries and increase their presence in the region. Other key areas of discussions are enabling geographical and product diversication of Indian exports to Africa, enhancing manufacturing exports of Africa by optimal utilisation of Duty Free Tari Preference scheme and capacity building support from India; expanding Indian investments in areas like infrastructure, agriculture and food-processing, energy, services, IT and knowledge industry. India's shrimp exports to the US were 15.6% higher in 2018 to 248,127 tonne and accounted for 36% of the total shrimps imported into the nation, according to the latest data of US agency National Oceanic and Atmospheric Administration. US imported 695,723 tonne of shrimp in 2018, a 4.8 % higher than the previous year. Indonesia comes second with 132,344 tonne and is followed by Ecuador with 75,891 tonne. India is the second-largest fish producer in the world after China and accounts for nearly 6% of the global fish production. In December, India exported 21,913-tonne shrimp to US, against 18,965 tonne in the year-ago period. Indian shrimp export growth is expected to slow down after four years of robust growth due to stiff competition from other suppliers, according to a report by credit rating agency ICRA. According to sources, Indian aquaculture output is estimated to touch a record 7 lakh tonne during the current fiscal and reach 1 MT by 2020. Seafood exports for the last fiscal touched $7.08 billion with 13,77,244 tonne exported, against 11,34,948 tonne and $5.77 billion in the year-ago period, according to state-run Marine Products Exports Development Authority data. A landmark in the history of inland movement through National Waterways 3 and 9 was achieved when the first barge, KPACT-1, with four TEUs of import loaded containers was flagged off last week from ICTT Cochin by the Chairman (I/C), Cochin Port Trust, in the presence of the Chief Commissioner of Customs, officials of the port, DP World, Customs, the shipping line and Kottayam Port. The barge will travel to Kottayam Port and ICD, thereby reducing the carbon footprint and congestion on the roads. A regular service between ICTT Cochin and Kottayam Port and ICD will greatly benefit importers and exporters by way of reduced haulage for the last and first mile connectivity. It is expected that the cost of movement by waterway will be 30 to 40 per cent cheaper compared to road movement. This is in line with the objective of Sagarmala, the flagship programme of the Union Ministry of Shipping, said a release. Direct liner service between India and the US, together with experience in transporting challenging break-bulk cargo awarded Hoegh Autoliners the shipment of a shore crane with lifting capacity of 400 MT and span length of 118 m.
The customer needed the cargo transported from the port of Ennore to Freeport, and Hoegh's Middle East and India to Americas service was the perfect solution, ensuring a direct service with minimum transit time and savings in transportation cost. Due to its large dimensions, the crane was knocked down into 51 static pieces for transportation. Transporting highly sensitive break-bulk cargo such as this requires experienced personnel and flexible cargo handling equipment, emphasised a release. Mr Atuldutt Sharma, Breakbulk Sales Manager in India, says, "To support the customer in preparing their sensitive cargo for shipment, Hoegh's cargo handling team was involved already in the pre-shipment phase. This involved studying the packing and dimensions of the break-bulk units and finding the most suitable equipment to ensure full cargo optimisation on board the vessel." Hoegh Autoliners' fleet of rolltrailers consists of various types and sizes to handle sensitive break-bulk cargo. The entire loading operation, including stuffing and lashing of each static unit on to the rolltrailers, was supervised by Hoegh's Port Captain. Once inside the vessel, the 12 rolltrailers were positioned by an experienced team and lashed in accordance with a carefully calculated plan, all to guarantee a safe sea voyage. Mr Atuldutt Sharma adds: "The successful shipment came down to the good collaboration between the customer and cargo handling team. The customer was satisfied with the safe, cost-effective and customised solution that was provided to transport their break-bulk cargo safely to its final destination." The Cabinet Committee on Economic Affairs, chaired by the Prime Minister, has given its approval for extension of time and scope for revival and development of un-served and under-served air strips of state governments, Airports Authority of India (AAI), civil enclaves, CPSUs, helipads and water aerodromes at a total cost of Rs 4,500 crore (Rs.45 billion) with the budgetary support of the government of India. As an outcome, small cities/towns shall be connected on commencement of operation of flights to under-served/un-served airports and it will further boost the economic development in these as well as surrounding areas in terms of job creation and related infrastructure development. The Ministry has received overwhelming response from airlines in two rounds of RCS bidding held so far. In the first round of UDAN bidding, 128 routes were assigned to five airline operators for 43 un-served/under-served airports/airstrips in 2017. The response from airline operators considerably improved in the second round of RCS bidding wherein 86 proposals involving 325 routes were awarded to 15 selected airline operators in January 2018. During RCS-UDAN version 1.0 and 2.0, 66 airports were identified and 31 heliports (28 un-served heliports and 3 un-served airports), said a release. Delegation from Indonesian Ministry of Foreign Affairs visits JNPT to identify potential cooperation opportunities between Indonesia & India A senior delegation from the Ministry of Foreign Affairs, Indonesia visited Jawaharlal Nehru Port Trust (JNPT) recently to explore potential cooperation opportunities in the maritime sector between both countries. This visit is part of their annual study programme with the theme, 'Connecting the connectivities in Indo-Pacific: Indian Ocean and Rim chapter'. Both Indonesia and India are maritime neighbours and seafaring nations who share synergies in the evolving maritime environment in the region and world at large. A collaborative effort from both nations will not only strengthen their maritime business but also facilitate stability and robust economic growth to the Indo-Pacific region. Speaking about the visit, Mr Sanjay, Sethi, Chairman, JNPT, said, "India is a significant contributor to the global container cargo business and JNPT has been the driving force behind this growth, accounting for around 55 per cent of the total containerised cargo volume across the major ports of India. Both Indonesia and India share a similar ideology towards business and culture at large, so we are more than willing to extend our full support in building stronger maritime partnership between both countries. We already have excellent trade relations and at present JNPT handles about 35 per cent of their total cargo imports into India. But with the overall expansion and upgradation of our port capacity, we will be able to handle larger vessels and more consignments from our ally nation. Both countries represent a combined maritime region which is important for global maritime trade and commerce." As part of the visit itinerary, the delegation first had a brief introduction about JNPT's overall operations, infrastructure developments, especially the new initiatives implemented to promote Ease of Doing Business and on the adoption of technology to improve the efficiency and quality of business at the port, which is providing overall benefit to the ex-im community. This was followed by a visit to the port to see the scale of operations there. The delegation then visited the SEZ project site and later interacted with the team at the SEZ to understand the recent developments, scope for investment and the strategic role this project plays in enhancing port-led industrialisation at JNPT and for the maritime sector as a whole. The visit helped the delegates gain a broad overview on the port and its significance in the global market. The discussion on the current trade engagement between Indonesia and India gave them a perspective on the plausible growth opportunities in business, which can be leveraged through the maritime sector, said a release. The Union Minister for Shipping, Road Transport and Highways, Water Resources, River Development and Ganga Rejuvenation, Mr Nitin Gadkari, inaugurated the Multipurpose Cargo Berths No. 14 and 16 at Deendayal Port through video-link from Transport Bhawan, New Delhi on Friday, at a function held in the Ministry of Shipping, in the presence of the Secretary (Shipping), Mr Gopal Krishna, IAS, and Mr Sanjay Bhatia, IAS, Chairman, Deendayal Port Trust (DPT). Gracing the inaugural function at the port's Berth No.16 were Mr Vinod Chavda, MP, Kutch, and Ms Maltiben Maheshwari, MLA, Gandhidham, besides port officers/employees, port users, stakeholders and media persons in large numbers.. The Multipurpose Cargo Berths No. 14 and 16 have been constructed ahead of schedule in 22 months and will add 9 MMTPA to the port's capacity. 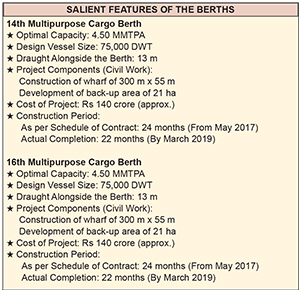 Entailing an investment of Rs 280 crore (Rs.2.8 billion), the berths have been designed to handle 75,000 DWT vessels with a draught of 13 m.
These berths will not only add to the capacity, but will also help in reducing congestion at the port to a great extent. They will allow the port to handle bigger ships and larger volumes of cargo, resulting in direct and indirect employment opportunities and economic prosperity in the region. The port authorities thanked all who were part of the inaugural function, said a release. On March 13, 2019, the Afghanistan Consulate General in Mumbai, with the cooperation of JN Port, organised a ribbon-cutting ceremony at Nhava Sheva for the first Afghan shipment to India via Iran's Chabahar Port. The occasion was graced by Mr Naseem Sharifi, Consul General of Afghanistan, Mr Vivek Johri, Chief Commissioner of Customs, JNCH, Mr Neeraj Bansal, Deputy Chairman of JN Port, Mr Khushru Reza Zadeh, Consul General of Iran, and Mr Arun Kumar Gupta, Managing Director of India Ports Global Ltd, besides dignitaries from CII and FICCI, who inaugurated the first Afghan shipment to India via Chabahar, said an official release. The first shipment contained 570 tonnes of Afghan exports in over 20 containers, which included 130 tonnes of mung beans and 440 tonnes of talc. Mr Naseem Sharifi said that "Chabahar is no more an imagination but a reality, which gives direct sea access to Afghanistan, and boosts trade and economic cooperation in the region". Mr Vivek Johri commented that "the arrival of the first Afghan shipment through Chabahar is a momentous event and will increase economic relations between the two countries". Mr Neeraj Bansal too described it as historic and called for more such cargo movements from Afghanistan via Chabahar. "With the opening of the Chabahar route, Afghanistan exports will increase from the current level of $ 1 billion to $ 2 billion in the next year," Mr Mohammad Ashraf Ghani, President of Afghanistan, had said. On October 29, 2017, the first wheat shipment of the Indian government to Afghanistan through Chabahar Port reached Zaranj province. The shipment was part of a commitment made by the government of India to supply 1.1 million tonnes of wheat to the people of Afghanistan on grant basis, the release said. In May 2016, India, Iran and Afghanistan had signed a business agreement on the establishment of a Transit and Transport Corridor among the three countries using Chabahar Port as the regional hub for sea transportation. This was the first shipment under TIR carnet from Afghanistan to India through Iran. India had joined the TIR Convention (the United Nations Customs Convention on International Transport of Goods under cover of TIR Carnets) in 2017. TIR stands for 'Transports Internationaux Routiers'. The convention allows goods to be outlined in a TIR carnet and sealed in load compartments. Customs verify the carnet and check the seals, with no need for physical checking of the contents, enabling shipments to pass through countries without being opened at borders. Indian Customs is the authorised agency to deal with TIR carnet and is responsible for the goods covered under TIR for transfer to other Customs procedures like import clearance, warehousing, etc. TIR is an international harmonised system of Customs control that facilitates trade and transport while effectively protecting the revenue of each country through which goods are carried. The TIR system has 68 contracting parties across 4 continents. For the trade, it is simple, flexible, cost-effective and secure system for the international transport of goods across frontiers. The TIR Convention is expected to boost trade not only with Afghanistan but with Central Asia and the Commonwealth of Independent States countries across the International North-South Transport Corridor and thereby augment business opportunities for exporters and importers in these countries, said a communique. The Port of New Orleans (Port NOLA) set a new record in 2018 with 1,182,111 cruise passenger movements, up 2.3 per cent compared to a year ago. A 23 per cent surge in guests taking Mississippi River cruises helped buoy the total, with new and larger ships set to sail from New Orleans both in the Caribbean and on the River in 2019. "Port NOLA's success is due in large part to the hard work of the stevedores, labour, cruise terminal staff and the support of local businesses and tourism partners," said Brandy D. Christian, Port NOLA President and CEO. "The popularity of New Orleans as a cruise port and our commitment to customer service proves again why Port NOLA is a catalyst for local businesses. With an increase in passengers, we see those increased benefits-from florists and food wholesalers to hotel and restaurant staff. Our homeport status is important for the local economy and helps us fulfil our role as an economic engine for Louisiana. A recent economic impact study conducted by LSU's E. J. Ourso College of Business determined cruise passengers and ship crews spend an estimated $129.1 million annually in the local economy. In 2018, 235 passenger ships called on Port NOLA, compared to 229 in 2017, and momentum and diversification continues to build. In September, Disney Cruise Line announced it will sail from Port NOLA in early 2020. The 2,700-passenger Disney Wonder will embark on a variety of Caribbean and Bahamian cruises from New Orleans-marking the first time Disney Cruise Line will have a homeport in Louisiana. In addition to Disney, the Port's most prolific cruise tenant-Carnival Cruise Line-will increase capacity in its four- and five-day cruise programme, replacing the Carnival Triumph on March 1 with the 2,980-passenger Carnival Glory. The Carnival Glory will sail the four- and five-day itineraries until May 19 when it begins seven-day, year-round itineraries, and the 2,980-passenger Carnival Valor arrives to sail year-round four- and five-day schedules. "Port NOLA is one of Carnival's most popular homeports and the Carnival Valor and Carnival Glory are wonderful ships that provide a wide array of exciting dining, beverage, entertainment and activity choices," Christian said. "As demand for cruises continues to grow, our cruise line partners are responding by deploying newer ships with more capacity and amenities." In addition to ocean-going ships, guests travelling along the Mississippi River on the five riverboats homeported in New Orleans also set a modern-day record at 30,298 passenger movements in 2018. The American Queen Steamboat Company homeports the 436-passenger American Queen and the 166-passenger American Duchess from New Orleans, while American Cruise Lines offers inland cruises on the 150-passenger Queen of the Mississippi and the 185-passenger America. The company's 184-passenger American Song, the first modern riverboat in the US on the Mississippi River, debuted in 2018 and will be replaced this year by her new sister ship American Harmony. "Ninety per cent of cruise passengers travel from out of state and 73 per cent spend a day or two in New Orleans either before or after their cruise," Christian said. "Of those, 75 per cent report making a purchase in the Crescent City and these passengers generate over 306,000 room nights per year in New Orleans-area hotels." The Port of New Orleans (Port NOLA) is represented by Samsara Shipping Pvt. Ltd in India, informed a release.